A slow, visually read FSK mode for weak signal work on LF. CASTLE is a variant of DFSK Morse, often called 'DFCW'. By eliminating the need for spaces between character elements, the new mode is about 30% faster than DFSK Morse, and almost three times as fast as conventional Morse or QRSS for the same element length. This means faster text throughput for the same sensitivity. 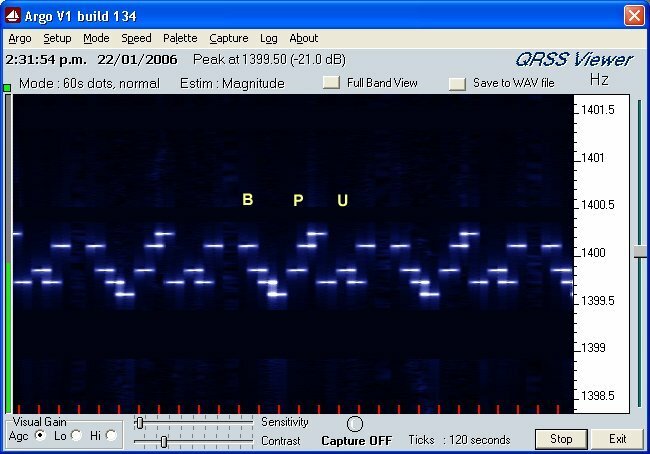 The mode is defined by the dot period, which is the length of an element in seconds (standard QRSS definition). The reference frequency for all character elements is the quoted transmit frequency, and is never transmitted. A suggested offset of 8/(dot period) will be used (e.g. 0.8Hz for CASTLE10 - 10 sec dots). The nth dot element of each character is transmitted at a frequency of reference frequency - n x offset. The nth dash element of each character is transmitted at a frequency of reference frequency + n x offset. No space or transmit gap is transmitted between elements of a character. The start of each received character can be discovered by looking for the first element of each group, which will be closest to the centre of the signal - the reference frequency - which is never transmitted. Why the name 'CASTLE'? Look at the picture! Battlements! If you don't like the name, try a suggestion by Bob ZL2CA - 'Bricklayer' Mode! Even with 60 sec dots, a three character message takes just 10 minutes to transmit. In this example, the offset is 0.125Hz, about the recommended value for CASTLE60. The signal is about 0.75Hz wide. Decoding is not really more difficult than for DFSK, and besides, there's plenty of time, right? CASTLE mode is available in the ZL1BPU LF Exciter, from firmware version D5c (available as a free upgrade to existing ZL1BPU LF Exciter users). It is also available in beacon compiling and control software MAKEBCN2 and MAKEBCN32 (the latter for Version D6b). The author encourages others to develop applications offering this efficient mode. As you see, ARGO displays this mode just as well as any other, but with room for more on the screen at any one time (at least 10 characters).